The expectations of Nigerians were high when the British Union Jack was lowered and the ‘green-white-green’ flag was hoisted on the 1st of October 1960, to mark the end of British colonial rule, which the country’s nationalists finally won in the struggle for independence, and the readiness to build dreams. The expectations the founding fathers of Nigeria had were undoubtedly high. The likes of Dr. Nnamdi Azikiwe, Sir Abubakar Tafawa Balewa, Dr. Alvan Ikoku and many others hoped to forge a country that would be truly one in name and attitude. A country where the citizens would be free to choose their leaders and where leadership is seen as an opportunity to render selfless service to the nation; A country where the wealth of the nation is used for its development and not squandered by the privileged few; and so on. The past heroes of Nigeria did not fail in their assignment, in fact they displayed utmost commitment, selflessness, dedication and integrity in the service to their fatherland. They utilised the provisions of the first post-independence constitution of 1963 to construct a workable structure that would accommodate the interest of more than 250 ethnic groups which formed part of the federation and make Nigeria ‘one nation bound in freedom, peace and unity’. They pursued their dreams with ‘heart and might,’ and one of the expectations of these founding fathers was to ensure the wealth of the nation is used for its development and not squandered. But let’s ask ourselves these questions: Are the present leaders really making good use of the nation’s wealth? Are they really doing justice to issues of utmost concern in the country with less emphasis or too much importance attached to religion, culture, ethnicity, political affiliation and what have you? It is no news that Nigerian leaders no longer rule with commitment, dedication, selflessness and integrity; they no longer rule with their heart and might; they no longer have the people’s interest at heart. Instead, they now use the nation’s wealth to enrich themselves through embezzlement. People are suffering! people are dying in the riverine areas and other parts of the country because there is no good water to drink; accidents here and there due to the deplorable state of our roads. You see massive queues at fuel stations with their gallons to purchase petrol because there is no power supply. Hence, they have to power their generators which causes noise and environmental pollution that affects the people’s health. Worst of it all, in government(of all levels), political office holders and their counterparts in other arms of government attach too much importance on regional, political and ethnic diversity in employment, political appointments, citing of infrastructural developmental projects and even in dishing out judgements to the average man on the street. Was this really the country the past heroes dreamt of? As Nigeria recently marked its 58 years anniversary, many believe that all hope is not lost as the country can still come out of the woods and make urgent amends where it has completely lost its direction but this can only be feasible if and when the current leaders are willing to uphold the tenets of justice and equity. They need to totally and unconditionally embrace the acts of commitment, selflessness, dedication and integrity as emulated by the founding fathers in service to their fatherland. They need to render accountability for their past and present misdeeds and bring forward with genuine concerns to the table, the pressing issues that has brought the Nigerian state to its conundrum as many believed that it is their total failure and inability to tow the path of the founding fathers contributed to Nigeria’s present mess. Today, they are singing a different tune, grandstanding as the prime apostles of Nigerian unity but if those issues perceived to be the harbingers of Nigeria’s disunity and separation is not addressed, if referendum, resource control, restructuring and other burning political issues is not wholly addressed, the Nigerian state shall continue to slid down to the abyss without the political game players realising this until it has became too late for any possible remediation. Those politicians and unconscionable leaders who has made themselves an arrow-head of the Biafran opposition which is at the spur of the moment should better realise that they cannot even make any meaningful progress in the country if the issue is not brought up for possible address. 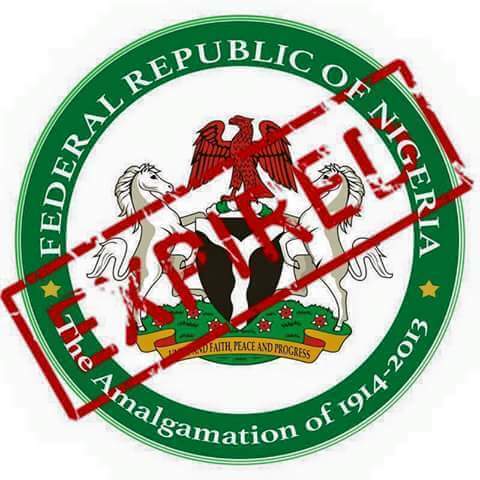 They also need to realize that indeed, they are the real elements of disunity and dismemberment of Nigeria. They are simply using a fleeting prank for the unity of the same country they are helping to set on fire. They so-called “unity” campaigns, however, unknown to them, is fanning the embers of disunity and division in Nigeria. It was none other than the Sultan of Sokoto, Muhammadu Sa’ad Abubakar III during the one-time visit of the incumbent governor of Rivers state, Chief Ezenwo Nyesom Nwike that pointed out that the secessionist movements did not come out of the blues. In Abubakar’s words, “A lot of things were done in the past by some people with impunity and nothing was done.” The Sultan appealed that statesmen across Nigeria “should help the country by championing a dialogue.” Though the unflappable Sultan apparently is yet to make any move to mobilize Nigerian leaders in the direction he has stated nevertheless, his comments goes a long way to show that most acclaimed leaders in the country are aware of the root causes of the situation and challenges that has bedevilled the Nigerian state, yet remained adamant and/or feigned ignorance of what exactly should be done to ameliorate the situation. Every one of them appears to be mostly concerned about his benefits while relegating the national interest of masses to the background. Be that as it may, the solution to the Biafran crisis does not have to be complicated. It is all about being able to face the truth. As Sultan Abubakar hinted, it lies in broad dialogue to correct past atrocities. Apart from the obvious imbalance in the current government, a starting point is to quickly uproot the poisonous seeds that were sown by the state during and after the Biafran war that have grown and are today swirling wildly, engulfing the entire nation. It ought to table why and how there is lack of general development in the densely populated South-East and South-South zones, for example, lack of reliable seaports and international airports despite the region’s overflowing resources. There is also the need to revisit whatever policy—the lingering war scar—that denatured the Igbo heartland into what is now being ridiculed as the “landlocked” South-East. More essentially, such dialogue must not fail to look within: Now is the time to bring to book the local politicians who connived with contractors to loot development projects in the region, particularly during the regime of Goodluck Jonathan, where the Igbos and their South-South kith and kin held sway. This bare exposé should be done with all honesty and open-mindedness and not be misconstrued as a veiled sentiment to favour a particular region. Nigeria cannot continue to hope to solve a problem by creating bigger problems. Thus, the prevailing pattern where the state attempts to deflate the Biafran agitation by nurturing seeds of discord within the Igbo or balkanizing South-East and South-South into hostile units, or rolling out military armored tanks and all kinds of ammunition against agitators is not only profoundly corrupt but also does more harm than good. Needless, therefore, to mention that any attempt to embrace corrupt politicians and unrepentant ethnic irredentists in addressing the Biafran agitation is tantamount to a pyrrhic victory. It is a hallowed equivalence of embracing a Judas as a Muhammad or Jesus Christ as the case may be.